Mr. Pikko was kind enough to cut up 2 hours of news for me to get this clip of my A Shirt for Sawyer bento shown on KITV News This Morning last week Thursday. 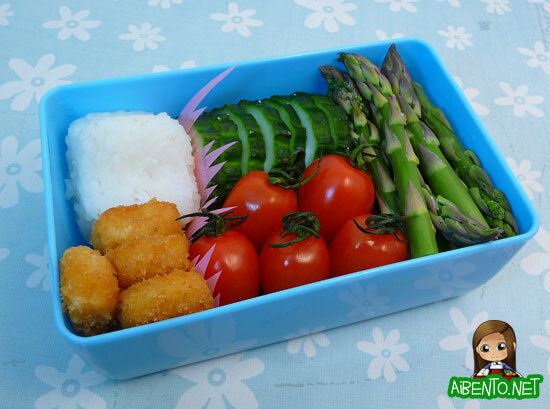 Today I have a pretty lazy bento. 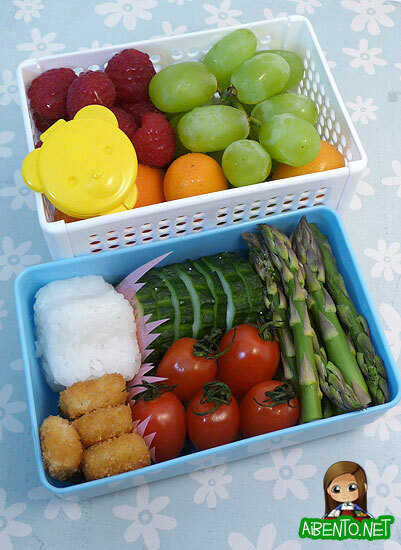 I had a bunch of fresh veggies that I needed to start using before they started to go bad, so I decided to pack up a lot of fruits and veggies along with a small amount of fish sticks and rice. I was supposed to cook them a certain way to ensure they were crispy, but I ran out of time to actually bake them. The asparagus went in first and I actually had to throw out the first 6 stalks I nuked because I put them on a plate with a metal ring and after seeing sparks in the microwave, I decided I didn’t want to risk eating metal and find out a year later that I have cancer because I was too cheap to throw out 6 stalks of asparagus. The cucumber is one that my dad gave from his farm. They’re strangely sweet and I found myself eating like a dozen slices the other day. The tomatoes are propped up on more cucumber slices so that the food looks even. I put a small star shaped onigiri in, separated by sushi grass, and then put the freshly microwaved fish sticks in after cutting them in half.